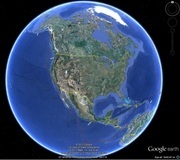 Google Earth & Google Maps - WELCOME TO VAGABOND GEOLOGY WHERE GEOLOGY ROCKS! 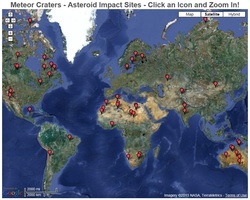 obvious asteroid impact sites with satellite images and maps. Click on the link below to use then use the buttons in the upper left to navigate and change your zoom level. Janisjarvi in Russia; Brent in Ontario, Canada; La Moinerie in Quebec, Canada; Goyder in Northern Territory, Australia; Mien in Sweden; Liverpool in Northern Territory, Australia; Lappajarvi in Finland; Chiyli in Kazakhstan; Haughton in Northwest Territories, Canada; El'gygytgyn in Russia; Aouelloul in Mauritania; Tenoumer in Mauritania; Tabun-Khara-Obo in Mongolia; Pretoria Saltpan in South Africa; Lonar in India; Nicholson in Northwest Territories, Canada; Serra Da Cangalha in Brazil; Gow in Saskatchewan, Canada; Riachao Ring in Brazil; Oasis in Libya; B.P. Structure in Libya; Mount Toondina in South Australia; Tin Bider in Algeria; Chukcha in Russia; Upheaval Dome in Utah; Talemzane in Algeria; Monturaqui in Chile; Wolfe Creek in Western Austsralia; and Amguid in Algeria. Many people refer to these structures as "Meteorite Craters". "Meteor" is the proper term for the object as it streaks through Earth's atmosphere. "Meteorite" is the term used for the object after it has fallen to Earth's surface. "Meteor crater" is the most common useage for craters produced by a meteor impact."